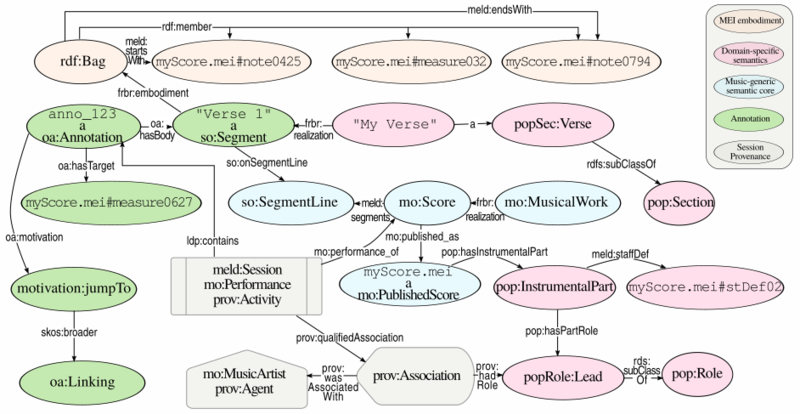 MELD is a framework that retrieves, distributes, and processes information addressing semantically distinguishable music elements. Music is richly structured, and annotations can be used interlink musical content within that structure. Annotations must be able to specifically address elements within this structure if they are to be described or related. In multimedia information systems, such addressing has typically been achieved using timeline anchors, e.g., an offset along a reference recording in terms of milliseconds. Such timed offsets are not musically meaningful, and are of limited use when no reference recording is available. We can address part of this issue using the Music Encoding Initiative XML schema (MEI), which comprehensively expresses the classes, attributes, and data types required to encode a broad range of musical documents and structures.